was an elementary teacher at Winterhalter for 4 years. Then raised my two children. Went back to colledge and recieved a second masters degree in education with a specialty in Recreation Therapy. my specialty population was the elderly. I did that for 14 years and then retired. I have 2 very beautiful Granddaughters. Allison who is 11. Hannah is 9. They both live in Larchmont, NY. Live mostly in Toledo, Ohio with husband Philip Silverman and my two children. Worked as a Recreational Therapist for 14 years. Retired and moved to Scottsdale ,Az. with my husband. We now enjoy a wonderful life in what I consider Paradise. I am very active with all my leisure activities. I am fortunate that I remain healthy. I look forward to the reunion and seeing all. Gruaduated from Wayne St. University with BS in Education. Got a masters in Education. Received another masters in Recreation Therapy from University of Toledo. Remember having my god friend always sign my absent letter. Never eating lunch at school but eating at Fredsons' Deli. Taking the Dexter bus to Woming and then walking 4 blocks to school. Everyone using my locker because it was on 1st floor. Barbara Berger Silverman has a birthday today. 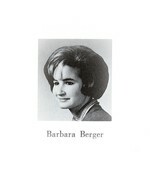 Barbara Berger Silverman has a birthday today. New comment added.